David Butler was born in the town of Good Hope, St. Mary Parish, Louisiana, to a missionary mother and a carpenter father. He dropped out of school to care for his seven younger siblings while his parents worked. He may have made toys to entertain the family, for since his childhood he drew pictures, whittled, and sculpted familiar and fanciful objects for both exterior and interior environments. Butler married a woman named Elnora and worked at a series of jobs—cutting grass and sugarcane, driving a buggy, and laboring in a sawmill, where in the early 1960s he suffered a job-related accident that left him partially disabled. He then bought a house in Patterson, Louisiana, and began to make the tin yard sculpture for which he later became well known. Inspired by images from his dreams, Butler sketched his ideas in chalk on corrugated tin roofing panels collected for him by children and friends. After placing the panels on the ground, he stood over them to flatten them with a hammer. Using ax heads, chisels, hammers, knives, meat cleavers, and shears, Butler cut shapes into and from the flattened tin. He may have learned from relatives how to work with metal, or he may have seen examples as a child. He cut, folded, or bent tin to achieve three-dimensional sculptures, then perforated the "snipped-tin" sculptural shapes with precise patterns painted with red, white, black, silver, green, and blue house paints. He frequenty decorated the works with buttons, pieces of plastic toys, bicycle reflectors, tinfoil, marbles, light bulbs, and other found objects, all attached with wire. He made kinetic sculptures, such as whirligigs, and stationary pieces, such as window shields. The window covers and awnings sheltered his house from both the hot Louisiana weather and, he claimed, from spirits. Butler felt compelled to make these "spirit shields" during a period of anxiety after his wife's death in 1968. Daylight passing through these screens would cast moving luminescent images across the floors and walls of the house's rooms. One three-part shield features a Nativity at the bottom, with two free-floating, movable stars and two cross shapes. Three cutout symbols, including a downward-pointing arrow, adorn the center panel. The top has cutout spaces indicating two sheeplike animals facing a fan blade that moves freely below two cutout star shapes. This movable fan could be a reference to the great star that appeared when Christ was born. The window frame was painted blue, brown, and white, with heartlike and triangular outline shapes in contrasting colors. Another three-part window shield with cutout designs features the story of Mary, Joseph, and Jesus leaving Bethlehem on a donkey, bound for Egypt, and surrounded by stars, hearts, and other symbols. These shields resemble Haitian cut-steel artworks made for religious societies, shop signs, and, later, tourists. Between other windows Butler placed a two-layered wooden cross with a commercially cast figure of Christ (Snowman and crucifix). Below the arms of the cross are two holes in the house, each surrounded by white paint, giving the impression of dark eyes, as if the house were watching. A mouthlike shape, a red circle with a black cross, appears at the bottom of the cross. Near his front door, Butler cut three spaces into the wall of the house, which he covered with a series of projecting trapezoidal shapes. The left one features a cutout star or cross, with a painted heart above and two stars below. The center shield depicts an embryo surrounded by a womblike shape. The right shield depicts an adult. In Haitian symbolism, or Veve, hearts are used as symbols for Erzulie, a goddess of love. These three shields may be a reference to Butler's wife's soul, but they could also refer to the cycle of Christ's life, with the nova star from the east leading to the infant Jesus and then to the risen Christ. Butler's desire to enrich and secure his home and surroundings led to the creation of a dense yard show composed of complex, wood and metal whirligigs, cutouts staked into the ground, decorated lawn benches, niches filled with recycled ceramic statues, and canes made from umbrella parts. One cane (Walking stick with figure) depicts an elaborately dressed (Mardi Gras?) high-heeled figure in the prime of life. Southern storytelling traditions are evident: "A lot of old-time folk faith, pain, dream, and fantasy forced way down inside—not unlike that found in Faulkner and in the blues: spliced fables, elaborated memories of real or fancied far-away places." In addition to anthropomorphic sculptures, Butler also made animal forms, particularly water-related ones such as snakes, fishes, mermaids, and sea birds. These shapes are remarkably similar to cut-metal animals made by the Fon peoples of West Africa. One of Butler's best-known creations was his eclectic bicycle, which he proudly rode around town. During his lifetime, Mary Lora wrote, "Butler doesn't care much for cars but rides the most wonderful bicycle. When the wheels turn, little tin birds bob their heads, colorful disks spin, a tiny man moves. There are bows and a flag and all sorts of ornaments." 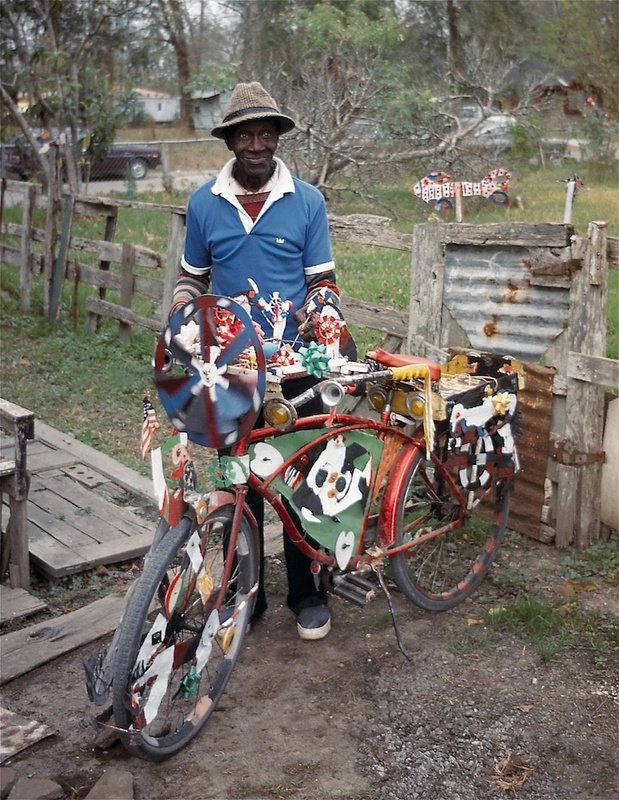 As with his whirligigs, the circular motion of the bicycle may be derived in part from Haitian beliefs in the cyclical rebirth of souls, for Haitian Vodun traditions have strongly influenced the arts and religion in Louisiana. Butler's bicycle, with its added elements, recalls Haitian charms made by combining various elements replete with symbolic and linguistic references. Although numerous cultural traditions are evident in Butler's art, the most dominant influences were perhaps the biblical stories told to him by his mother. Haiti also has its Catholic and Kongo symbols, such as the red circle with the black cross, which might refer to the Kongo-Haitian belief in the four moments of the sun, or the recycling of the soul. Butler's art also falls within an African American vernacular tradition of making or purchasing protective symbols and charms believed either to deflect unfriendly forces or to attract and contain them, as do bottle trees and symbolically decorated graves. Butler improvised upon all these traditions. With the shadows inside his house constantly shifting, and the field of whirligigs perpetually responding to breezes, his yard and home were dominated by art in motion. His complex symbols were continually recombined as nature's forces manipulated the art's physical forms. When he left his land, he even took this protective, kinetic art with him on his bicycle. Butler's yard pieces, designed to be portable, were regularly sold by the artist and replaced. His most important work may have been done before the mid-1980s, when his health began to fail. At that point, his nieces and nephews took over the embellishment of much of the artwork that Butler continued to cut, but the painting was often less interesting than it had previously been, and the work as a whole tended to suffer. When his health finally collapsed, he stopped making art altogether, lived with relatives at times, and at last entered a nursing home in Morgan City, Louisiana. The Butler house and the remains of the yard show were eventually dismantled. 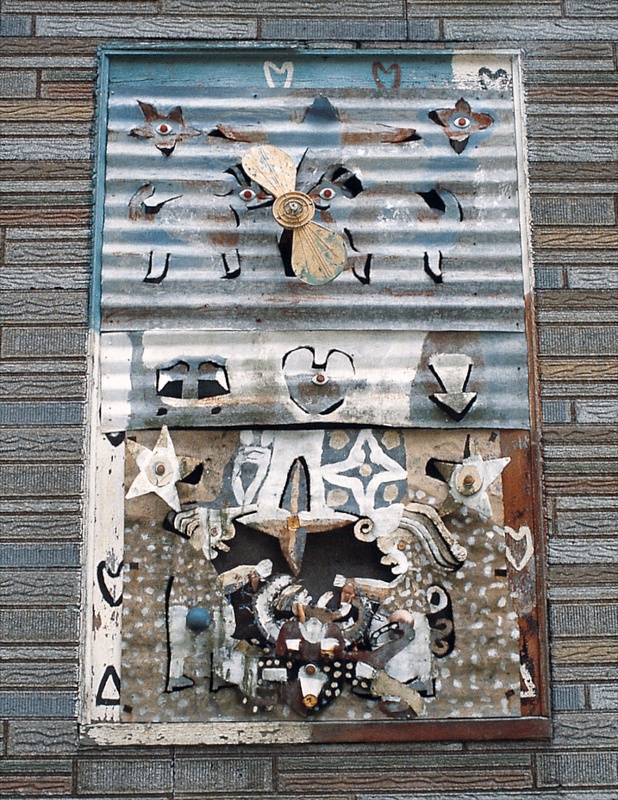 Although David Butler's style is unique, other African American vernacular artists also work with metal in ways that resemble traditional metalwork seen in the Caribbean. Thornton Dial, Sam Doyle, Robert Howell, Lonnie Holley, Joe Minter, Charlie Lucas, Mary T. Smith, and Hawkins Bolden have also used cut, painted, or twisted metal to make artistic statements. Whether we can convincingly trace these traditions back to African precedents, the visual resemblances are as real as the belief among many African Americans, including Butler, in the transforming power of objects that continue to be made and used.